Team leadership training - accelerate your business with horses! A team leadership training with horses? Why horses, you must be asking yourself? There are several good reasons why a day with horses can help your team walk jointly in the right direction! A horse sends out very clear messages when a team is aligned and when not, for example by standing still and not willingly following a team which doesn't know where it wants to go. The horse requests for every team member to be aligned with the common goal - this means that they all understand what the goal is and everyone feels accountable for the right outcome and takes the necessary actions based on his or her level of responsability. Each person is unique. And every horse is different. We cannot treat everyone the same way or expect that they all see the world through our eyes. If we just push through with our agenda - without taking into consideration the differences in culture, background, experience and personality of our team members - we are bound to create frustration, tension and mistrust, and ultimately fail. To get the results we want, we need to take the time to stop, listen and understand the differences - only then can we find an effective way of communication our goals and desires to each team member and make sure they understand and can fulfill our request. In today's business world, where hirarchies are flattening and followers more and more have a say in the common decisions taken - supporting the leader when the right path is found, or speaking out loud when they disagree with a decision their leader has taken - it is important to sometimes change positions and see things from a new perspective. "You cannot be a leader, and ask other people to follow you, unless you know how to follow, too." It is important that followers understand what it takes to be a good leader - and how it feels to be in that position. It is equally important for a leader to be aware of what followers are expecting of him / her, or to just gain a new perspective because from behind you suddenly notice things which you can't see when you are always walking in front! 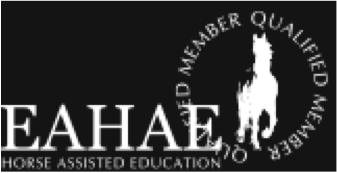 For people who have never been in touch with horses or don't have great experience, a team leadership training day with horses can seem daunting. These people usually make the experience during the course that they don't have to face their fears alone - and that it is fine to ask your colleagues or an outsider for help. As leaders we often feel that we have to go our way alone and that we are supposed to know everything. But in today's world, that is no longer possible, and although the leader will be the one who has to take a final decision, leading is also a group undertaking. A good leader knows how to identify, hire and develop a great team that he can rely on when needed. Leaders often spend a lot of time in the front, leading the way, setting direction and speed. Unlike horses, since we don't have eyes in the back of our heads, we sometimes miss what our team is up to and overlook the small cues or requests until it's too late and the team has already fallen apart or lost connection. It is therefore important to be reminded that we sometimes need to turn around and check if everyone in the team is still aligned, coordinated, and following! 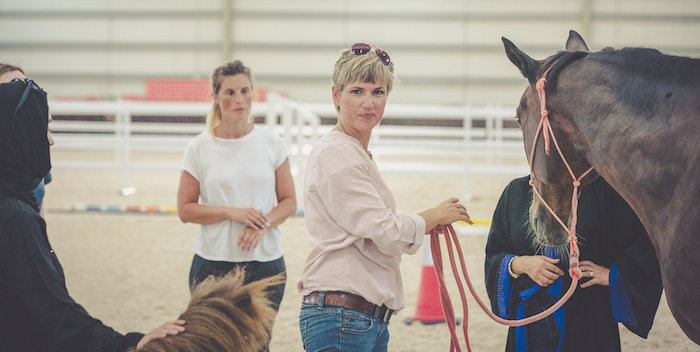 Indoors in Abu Dhabi all year round or outdoors in Dubai during the winter months - get in touch now to discuss how your team can benefit from a day with horses!